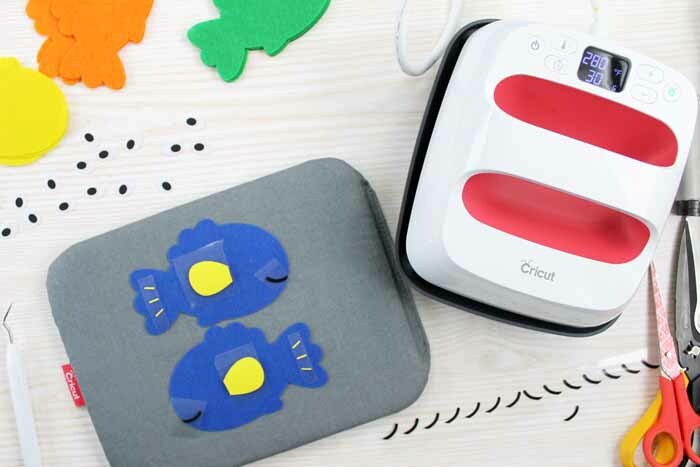 A magnetic fishing game is actually pretty simple to make yourself especially if you have a Cricut machine. 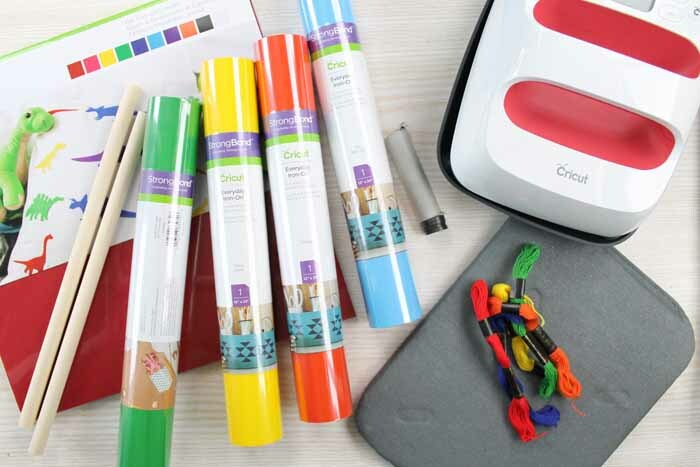 I am going to show you how to use your machine as well as the all new Cricut EasyPress 2 to make this fun gift idea. This post is sponsored by Cricut, however, all projects and opinions are my own. Also, please note, this project does contain magnets therefore I recommend for only children 3 years of age and older and that you supervise them when playing with this game. Please note that some links below may be affiliate links which means that you do not pay anymore, however, a portion of your purchase will go to support this site. You can actually watch me make this project in the video below as well as learn a bit more about the Cricut EasyPress 2. Can’t watch the video or missed some of the steps? Just follow along with the step by step instructions below. 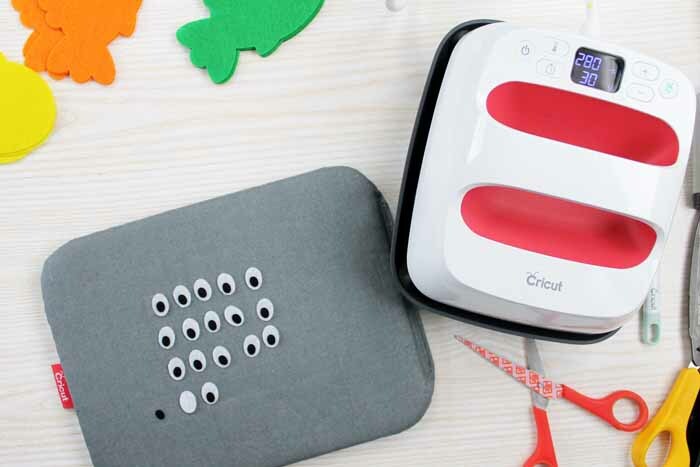 Get the cut file by clicking here then cut all of your pieces on your Cricut machine. 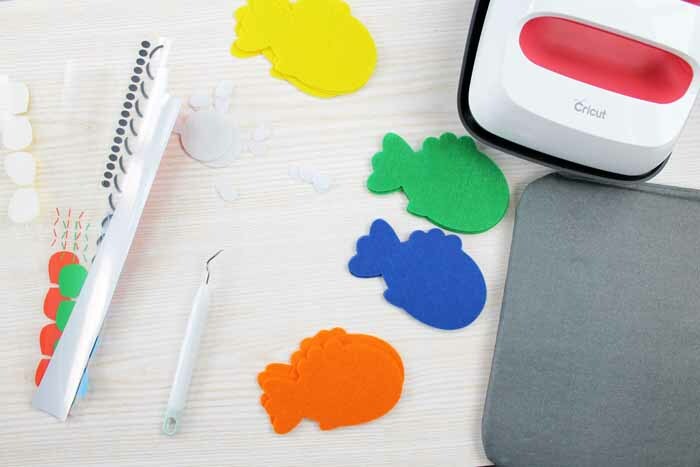 You can use whatever colors you would like and you can also cut as many or as few fish as you would like. Just be sure to mirror the image when cutting from iron-on and cut shiny side down. Gather your cut pieces and weed any excess from your iron-on pieces. 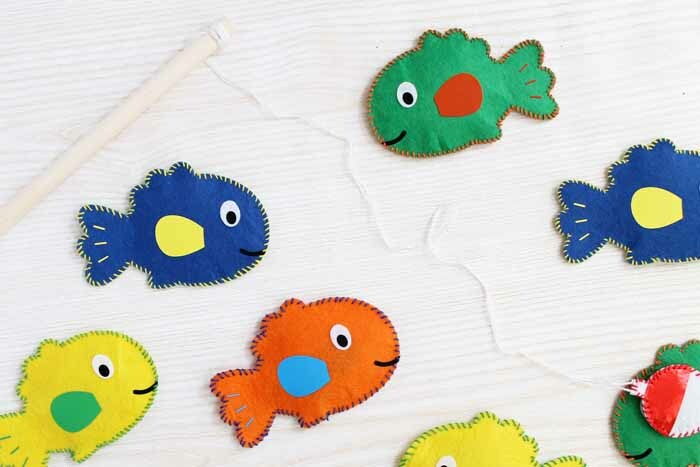 Then, you can start to add to iron-on to your felt. For the bobber below, I went with a red foil iron-on product. 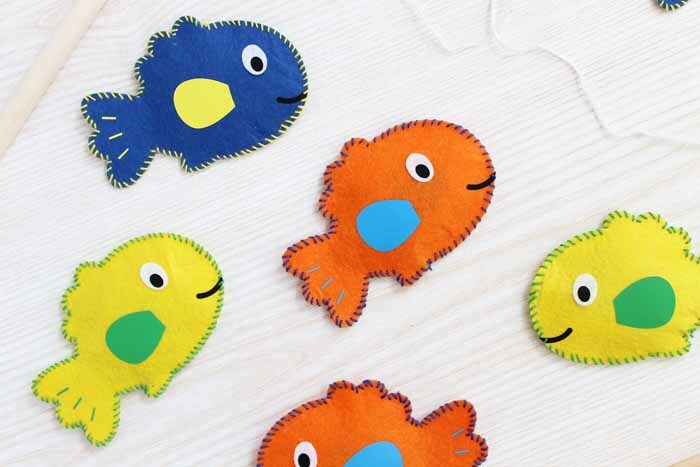 Be sure to preheat your felt, place your iron-on, then press for the recommended amount of time and at the right temperature. You will then want to flip your pieces over and press on the back for the recommended amount of time as well. You can find recommended settings for the EasyPress by clicking here. Then either wait for the project to cool before removing the carrier or peel right away. The “warm” or “cool” peel will be indicated on the EasyPress chart here. I am actually using the smallest size of EasyPress. This version has three sizes – 6×7, 9×9, and 12×10. This smaller size is great for little projects like this one but that did not prevent me from doing more than one piece at a time! In fact, I did all of these eyes with one press. Note that they are black iron-on applied to a felt eye. 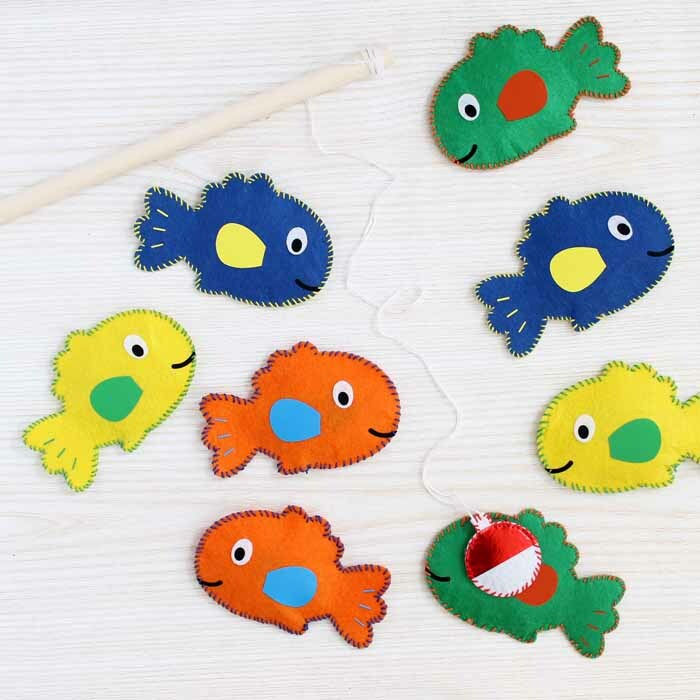 You can even press two of these fish at the same time. 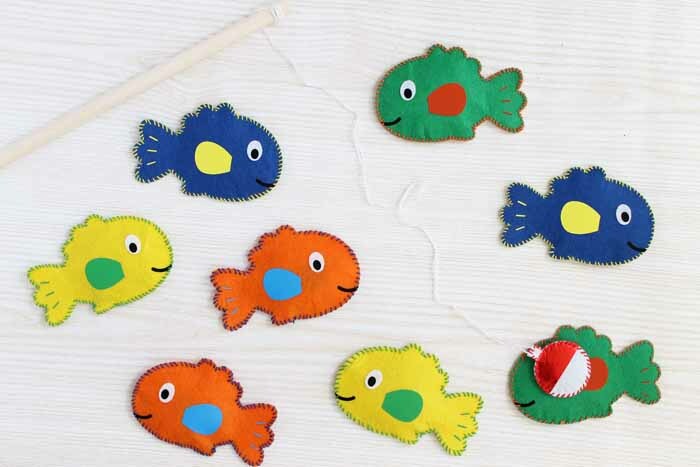 Add the fin, tail embellishments, and smile all at the same time as they are the same type of iron-on in this case. Want to use different types here? Just press the type with the highest temperature or time first and work your way to the least. 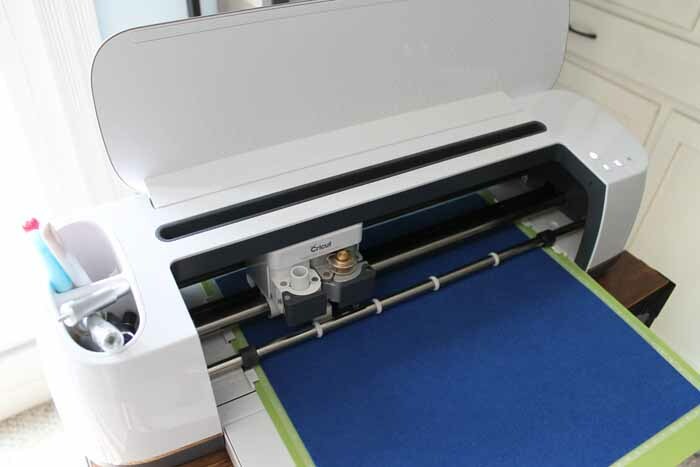 The EasyPress is the easiest way I know of to get professional iron-on results in 60 seconds or less. The main benefit is the ceramic-coated heat plate that offers up dry, even heat for flawless transfers. It is so much better than an iron y’all! Irons are so inconsistent and the results can be super frustrating. The EasyPress 2 actually offers up a faster heat up time as well as precise temperature control up to 400 F – which is an improvement over the first version. With the EasyPress 2, you also get the insulated, streamlined Safety Base. This keeps EP2 in a protected resting position while also protecting your surface. You can see the base with the press in the image below. The easy to read digital display shows you both time and temperature. And, of course, it still beeps once the time is done for super easy pressing! On the back, you will also find a USB port for firmware updates. And the only way to get that fabulous rasberry color is to get an EasyPress 2. I don’t want to leave the post, however, without a mention of the EasyPress mat. 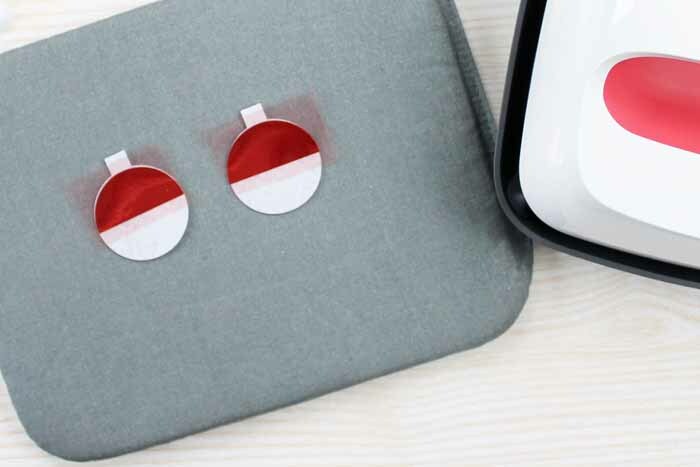 It also comes in three sizes to match your EasyPress. You can use a folded towel under your EP but I find the mat is so much better! Just a little note that once you get the mat you will never go back. Now onto finishing up that project! 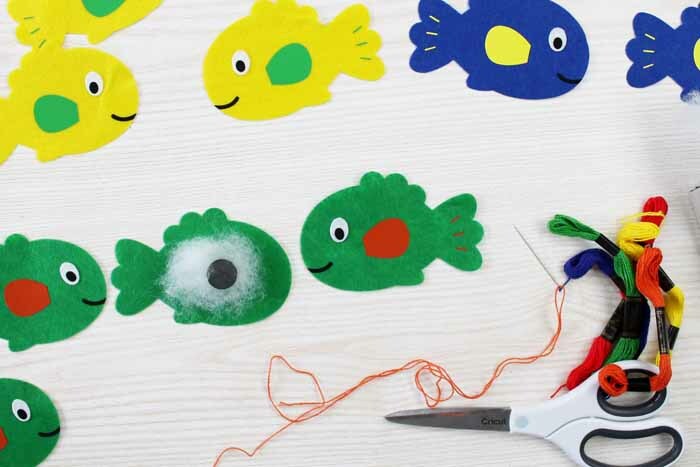 To assemble your fish, start by adding the eye into place with either fabric or tacky glue. Set those aside to dry completely before continuing. 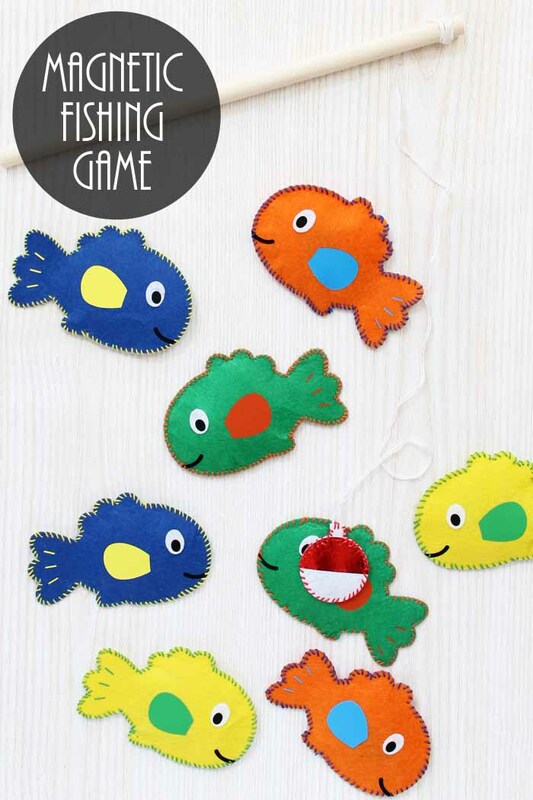 Once dry, add a small amount of stuffing and a magnet to the inside of each fish. Then hand stitch around the outer edge of each one trapping the magnet inside. I am using a contrasting thread but you can choose whatever color you like. 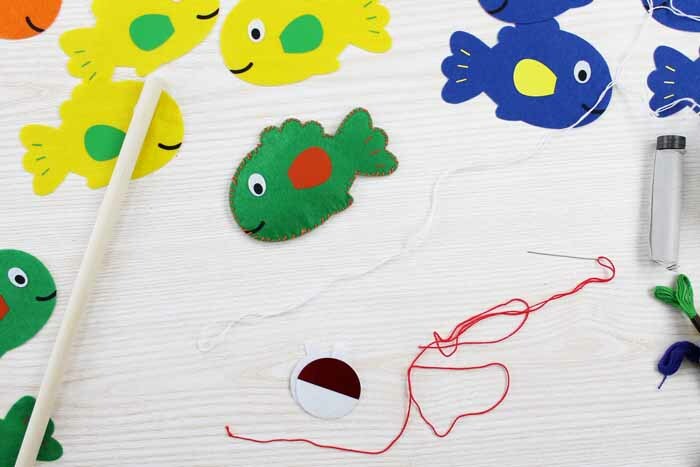 You will want to make absolutely sure that the magnets cannot come out of the fish as they are a danger to young children. Next you will repeat the same process for the bobber. 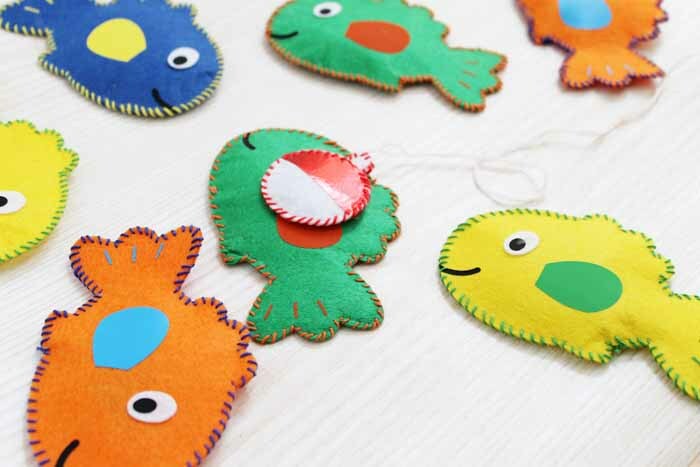 In this case, you will also added a looped piece of thread to the top of the bobber as you are sewing. This will be used to add to your dowel in the next step. Then once you have sewn around it, add it to the fishing pole with a bit of white thread. I used a combination of tying it on the dowel rob and securing with hot glue. 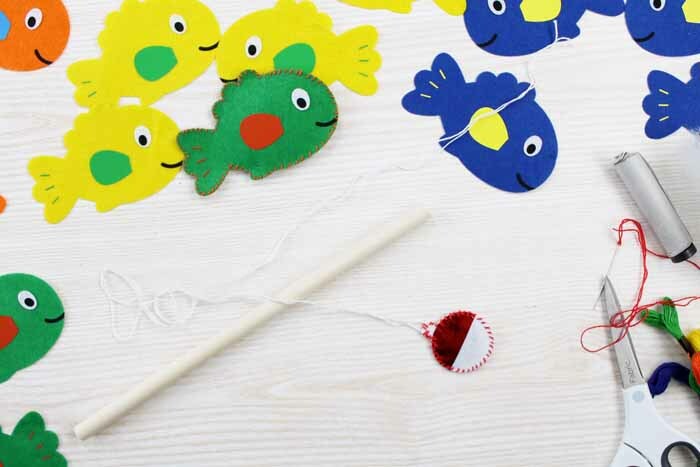 All that is left is to give your magnetic fishing game a little test. The bobber should stick to the fish and lift them up easily! 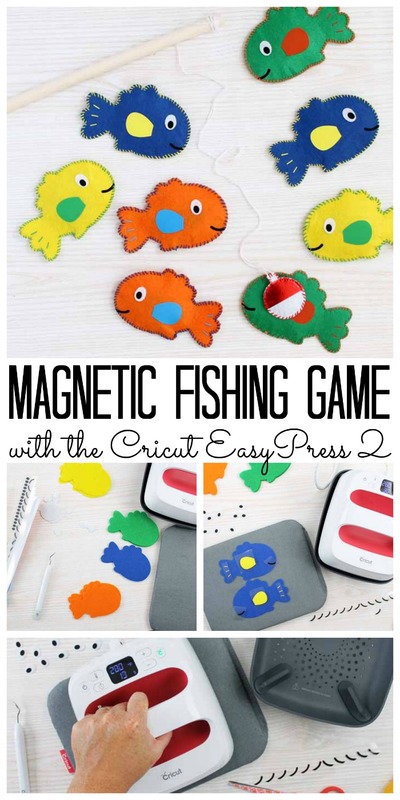 Any child would love getting this fun game for a gift and you will love how easy it is to make with your Cricut machine and your Cricut EasyPress 2.
Who will you make this magnetic fishing game for? 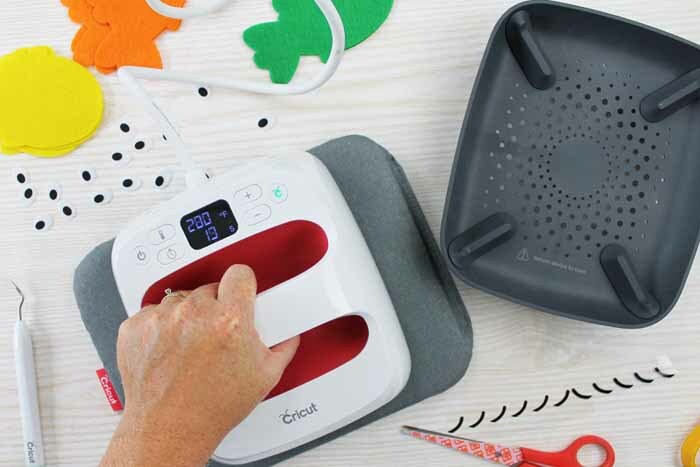 And will you be getting the new Cricut EasyPress 2? I can’t wait to see what you create! I am off to think of some more creations that are the perfect size for my new small EasyPress! I absolutely love this DIY! 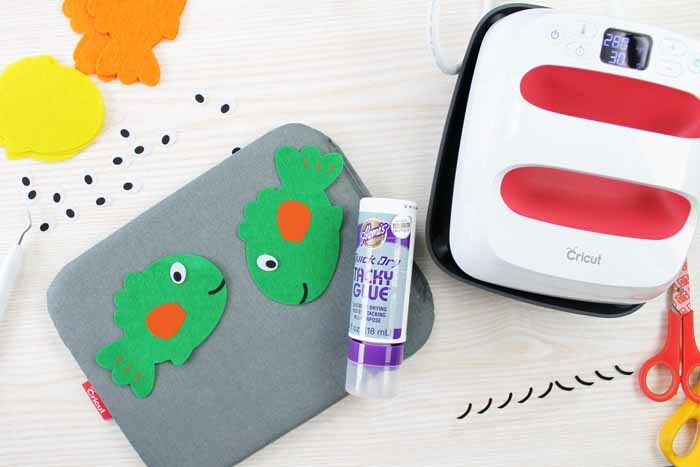 Such a fun idea and kids will love it! Super cute idea, and a great video! Love the game too! Thank you for sharing at Celebrate It! I’m excited for the new EasyPress 2. My kids would love this game. Thanks for sharing at Merry Monday. Hope to see you next week!